Many regional varieties of pickling cucumbers have existed since the mid 1800s. Boston pickling, developed in 1880, grows in clusters and is still considered one of the best tasting and most disease resistant. Vigorous vines produce an abundance of uniform. dark green, medium sized cucumbers which are smooth and symmetrical. 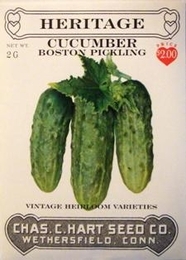 Boston Pickling cucumbers measure 5 to 7 inches long by 2-1/2 inches in diameter. Plant seed outdoors in late spring when ground is warm and danger of frost is past. Traditionally planted in hills (a small ring of 4 ? 6 seeds) they can also be planted in rows. Hills or rows should be 4 to 6 feet apart. Cover seed with 1/2 inch of fine soil, well pressed down. Keep moist until seeds sprout. When plants are 2-3 inches tall thin hills to 3 to 4 of the strongest plants. Can be planted until mid-July. Bulk Heirloom Pickling Cucumber seed available. 1100 Seeds/oz. Plant 1/2oz per 100ft row. 3lbs of Pickling Cucumber seed needed per acre. On average, 1oz of seed can produce 800 Pickling Cucumber plants.